Turkey and the United States announce Washington will withdraw its Patriot missile batteries from the country in October. 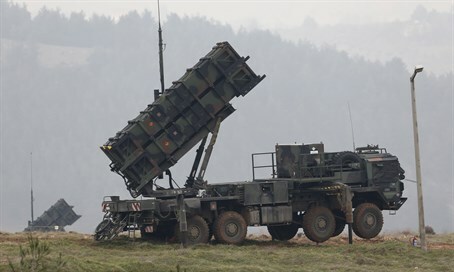 Turkey and the United States said Sunday that Washington would withdraw its Patriot missile batteries from the country in October, after bolstering Ankara's air defenses against threats from Syria's civil war. The NATO mandate for the mission will run out in October and will not be renewed, but the United States is prepared to return Patriot assets and personnel to Turkey within one week if needed, a joint Turkish-U.S. statement quoted by AFP said. "They will be redeployed to the U.S. for critical modernization upgrades that will ensure the U.S. missile defense force remains capable of countering evolving global threats and protecting Allies and partners, including Turkey," the statement said. It also emphasized that Washington remains "committed to supporting Turkey's air defense capabilities, including against ballistic missile risks and threats... and its security and regional stability." A U.S. defense official stressed that the move was for the purpose of force modernization. "It does not reflect a decision by the NATO Alliance to reduce support for Turkey's air defense," the official told AFP. The decision comes less than a month after Turkey opened its southeastern Incirlik air base to American fighter jets to carry out bombing raids against Islamic State (ISIS) targets in Syria. Turkey turned to its NATO allies for help over its troubled frontier after shells landed on its border areas from Syria in October 2012, killing several villagers. The Patriots first arrived in Turkey at the start of 2013, and the United States later decided to keep the batteries in Turkey for another year to help bolster the country’s air defenses against threats from Syria’s civil war. Syria’s ally Iran also condemned the move, claiming that the deployment of Patriot missiles in Turkey is designed to protect Israel from Iranian threats. The United States, the Netherlands and Germany have provided a total of six Patriots batteries along the Turkish border with Syria. Germany on Saturday announced it would withdraw its two missile systems from Turkey from January 31, saying that the main threat in the region now came from ISIS. Originally used as an anti-aircraft missile, Patriots today are used to defend airspace by detecting and destroying incoming missiles. NATO deployed Patriot missiles in Turkey during the 1991 Gulf war and in 2003 during the Iraqi conflict.